Our facility has been proudly providing repair services for Ebel watches for over 20 years in Marina Del Rey, California. Marina Bay Watch Company carries all the state of the art equipment to properly handle and care for your Ebel watch. It is our priority that every service we provide for your watch, it will meet Ebel factory specifications. Marina Bay Watch Company has the proper training to handle all your batteries for your Ebel watch. It is our highest priority that when we change your battery, your watch will maintain its original factory water resistant properties. Our technicians follow a critical procedure in replacing your battery properly including gasket replacement if necessary and water testing. We provide Ebel battery replacement on every quartz model made. Ebel watches require a special tool to replace the battery safely and effectively that we provide. Here at Marina Bay Watch Company our experts can replace your battery and reaseal it back up to original factory specifications in usually within 30- 60 minutes. While you are waiting to have your battery changed, be sure to inquire about Refinishing your watch. Refinishing usually takes 80% of the scratches out and makes your watch look practically brand new. Usually batteries and refinishes can be done within 1 hour. Our company provides full service on Ebel watches including: mechanical wind, self winding and quartz watches. Services for your watch that we provide also includes sapphire crystal replacement, Dial Replacement, Dial refinishing, Crown replacement, Band sizing, Band Replacement, gasket replacement, Band and Case refinish, water testing, bracelet repair, leather band replacement and many other services. Steps involved in Ebel Repair & Service are as follows. One year Battery warranty on all Ebel Watches. All Ebel repairs include a one year warranty! Here is some history on Ebel Watches! 1911 • On July 15th,Eugène Blum and Alice Lévy applied to register the Ebel brand for watches (Eugène Blum Et Lévy) with the chamber of commerce in the watch making capital, La Chaux de Fonds. 1912 • EBEL brought out its first wristwatches. 1914 • EBEL won a gold medal at the Swiss National Exhibition for patented ring watches with pallet escapement and hidden time setting. From then on, other brands ordered complete watches from EBEL for resale under their own name. This became the company's main activity during the following decades. 1925 • Grand Prix Commemorative Diploma at the International Exhibition of Decorative Arts and Modern Industry in Paris, for making High Jewelry Art Déco wristwatches in platinum, onyx, diamonds and emeralds. 1929 • Charles-Eugène, the son of Eugène Blum and Alice Lévy joined the family firm in October. Together with the watchmaker Marcel Reuche, he introduced infallible production control systems, which guaranteed irreproachable quality. The brand attracted demanding new clients, such as the VACHERON & CONSTANTIN brand ASTRAL.Under the name PAUL BREGUETTE, EBEL created wristwatches specially for the American market. 1935 • Diploma at the Brussels Uiversal Exhibition. Ebel was the first watch company to set up the "Western Electric" precision evaluation system. 1935 •Paris Diploma of Art and Technique. 1939-1945 • Ebel went into watch production for the British Royal Air Force. 1952 • Videomatic watch, including one of the first retort automatic movements. 1952 • Châtelaine, a magnificent watch, inspired by the original design of the "Châtelaine" belt. 1961 • Charles-Eugène Blum celebrated the firm's 50th anniversary with the PRESIDENT model and EBEL caliber 059 with a winding crown that turned backwards. 1964 •First prize at Swiss National Exhibition for the Lune Étoilée in the jewel watch category. 1970 • Ebel won renown with Pierre-Alain Blum. 1971 • EBEL's turnover increased by 30%. 1973 • Pierre-Alain bought a 70% stake in Ebel from his father Charles. 1975 • Pierre-Alain Blum in sole control of brand. 1977 • Creation of the SPORT CLASSIQUE line, which, with its famous wave design bracelet, was a huge success. EBEL commissioned to produce watches for CARTIER. 1982 • Launch of the Chronograph SPORT-AUTOMATIK equipped with Zenith EL PRIMERO caliber. 1983 • Launch of the Perpetual Calendar Chronograph. 1986 • ARCHITECT OF THE TIMES introduced to mark the brand's 75th birthday. Ebel acquired the Villa Turque at La Chaux-de-Fonds, a Le Corbusier building dating from 1916-1917. 1989 •Launch of the Voyager. 1991 • Launch of the Beluga Lichine. 1994 • EBEL joined the INVESTORS CORPORATION (INVESTCORP). 1995 • Launch of the Modulor 1911 Chronograph. 1996 • Pierre-Alain Blum resigned.1997 • Launch of the BELUGA. 1999 • Launch of the E TYPE. EBEL brand taken over by the LVMH group in October. 2001 • Launch of the CLASSIC WAVE. Remake of the 1911. Introduction of the BELUGA MANCHETTE. Launch of the SATYA. 2002 • Perpetual Calendar. Launch of the BELUGA TONNEAU. Introduction of Jewel watch on the theme of MER OF THE SUD (Southern Seas). The Architects of Time. Luxury Swiss watches Manufacturer since 1911, Ebel bears the imprint of time. 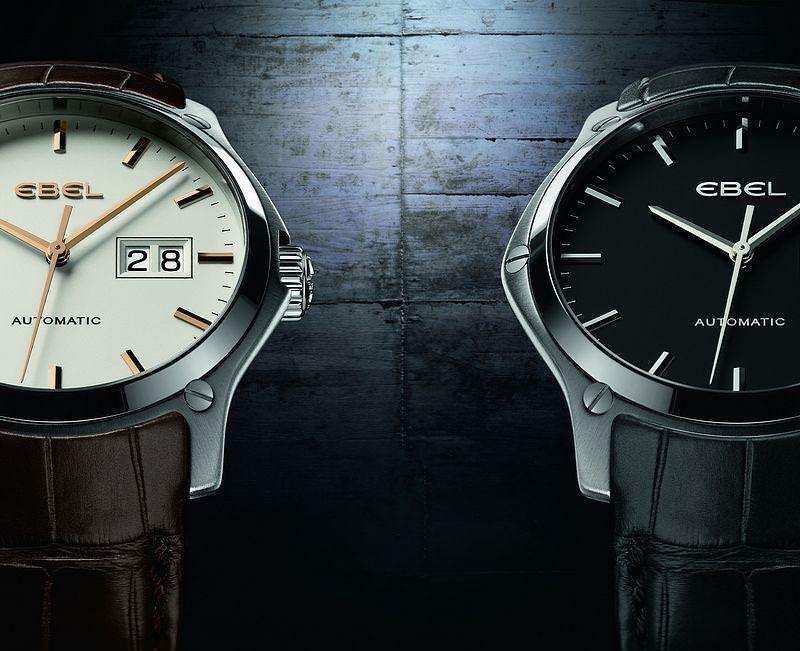 Ebel Watches epitomise excellence and a passion for design.